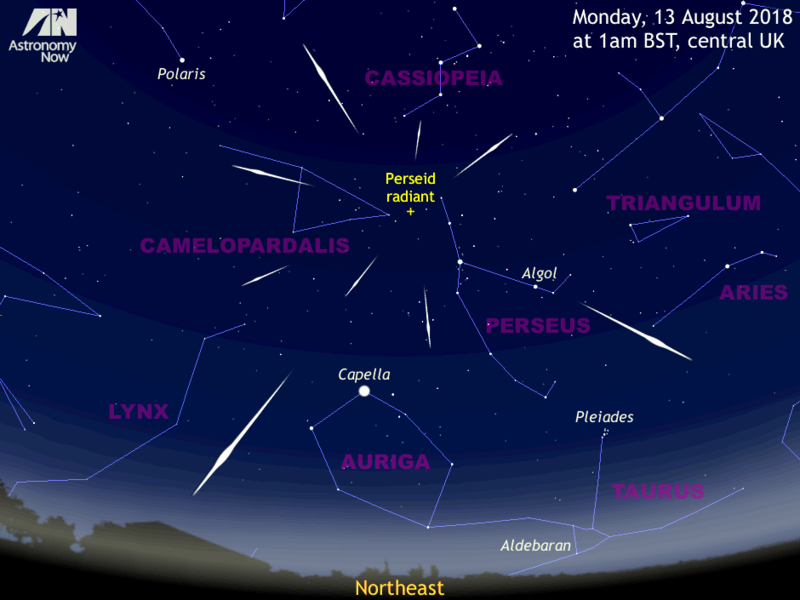 Perseid meteors originate from fragments of comet 109P/Swift-Tuttle strewn along its 133-year-long orbit. The Earth intersects the densest swarms of these particles around 13 August each year, but the shower is active from 17 July–24 August. The cometary debris enters our planet’s atmosphere at speeds up to 36 miles per second, vaporising from friction with the air causing the streaks of light we call shooting stars. This graphic shows a view centred on the northeast 90 degrees wide — about four spans of an outstretched hand at arm’s length — at 1am BST on Monday, 13 August for the heart of the British Isles. The radiant is the position in the sky from which the meteors appear to originate. After midnight we are turning into the stream, so the velocity of the meteoric particles is higher. Click the illustration for a larger version. AN graphic by Ade Ashford. It’s that time of year again when Northern Hemisphere skywatchers turn their attention to the Perseids, the favourite meteor shower of many an observer. Although not as rich as the December Geminid shower, the reliable Perseids grace the skies of late summer in the holiday period when families and friends can gather in comfortable temperatures to watch these bright, fast meteors — the more explosive examples leaving persistent trails. 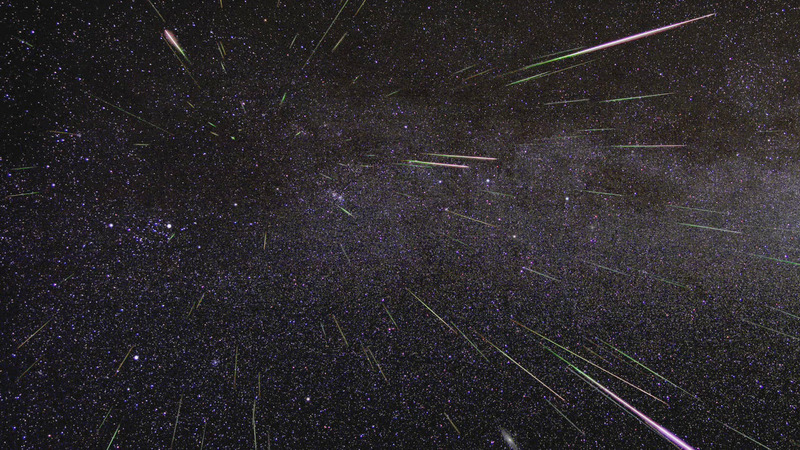 Perseid meteors originate from rocky debris left in the wake of comet 109P/Swift-Tuttle, strewn along its 133-year-long orbit. In the period from 17 July to 24 August, the Earth punches through this widely-dispersed cloud, causing particles to enter our planet’s atmosphere at speeds up to 58 kilometres per second (36 miles per second). At this velocity of almost 130,000 mph, friction with the air causes the debris to vaporise, creating the streak of light we call a meteor. Amazingly, most meteors are caused by particles the size of a grain of sand; a spectacular fireball might be caused by something the size of a pea. While you might see lucky enough to see such an event on any moonless night over the month-long duration of the Perseid shower, the intensity and frequency of meteors reach a relatively short-lived peak around the night of 12–13 August. At this time you could, under dark and favourable conditions, see a shooting star every minute. This time-lapse image of a Perseid shower shows that the meteors appear to originate from a point in the constellation of Perseus — the radiant — close to the so-called Double Cluster, a pair of open star clusters just to the left of centre. The radiant is a phenomenon of perspective since the meteors are entering the Earth’s atmosphere in approximately parallel paths. Note the rich backdrop of Milky Way stars and the Andromeda Galaxy at the bottom, just right of centre. Click the picture for a larger-scale version. Image credit: NASA. Predicting meteor shower maxima is a difficult science. The swarms of tiny meteoroid particles orbiting the Sun are easily deflected by the gravitational tugs of planets, so predicting when the Earth is most likely to intersect the densest clouds of this cometary debris is difficult. The best predictions indicate that peak activity will occur between 20h UT (9pm BST) on 12 August and 08h UT (9am BST) on 13 August. With a day-old lunar crescent setting at the end of civil twilight on the night of the Perseid maximum, moonlight won’t be a problem this year. Weather permitting, conditions will therefore be perfect. Nautical dusk (when the Sun is 12 degrees below the horizon) occurs at 10:25pm BST on 12 August for the centre of the British Isles and full darkness falls at 11:38pm BST (don’t forget to consult our interactive Almanac to obtain precise sunset and twilight times wherever you live). Soon after midnight, the Perseid radiant lies about 40 degrees (twice the span of an outstretched hand at arm’s length) above the northeast horizon in the UK. Faint meteors are the most plentiful, so to maximise your chances you should find a safe location that is as far removed from streetlights and other sources of light pollution as you can and allow your eyes to become fully dark-adapted over 20 minutes or so – no taking a sneaky peek at your smart ‘phone as you’ll have to spend another 20 minutes getting your ‘night eyes’ back again! A thermos flask of your favourite hot beverage and a reclining chair or even a camping air mattress is a good idea as you’ll be still for long periods during your watch. Don’t forget to bring an extra jacket or a blanket as temperatures can dip after midnight when shooting stars are most plentiful. The beauty of meteor watching is that you don’t need specialist equipment; your unaided eyes – with spectacles for distant viewing, if you need them – are perfect. Observing with family and friends is always fun and you can make it something of a ‘Perseid Party’, sharing the oohs and aahs when a particularly brilliant shooting star graces your sky. While it may be tempting to concentrate on the radiant in the northeast, let your eyes wander around the sky. Even if you miss the occasional bright Perseid, there’s a beautiful swathe of Milky Way passing overhead as seen from rural areas. The sheer observing power of the Hubble Space Telescope is rarely better illustrated than in an image such as this. 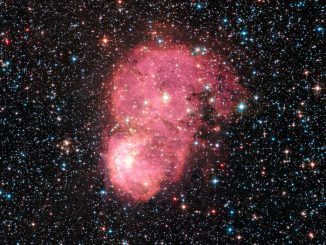 This glowing pink nebula, named NGC 248, is located in the Small Magellanic Cloud, just under 200,000 light-years away and yet can still be seen in great detail. Australian scientists have taken a critical step towards understanding why different types of galaxies exist throughout the universe. 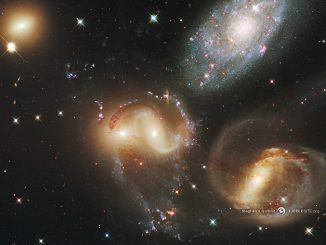 The research means that astronomers can now classify galaxies according to their physical properties rather than human interpretation of a galaxy’s appearance. If you’ve never seen a comet, there’s currently a bright example visible in the late evening about to make a close approach to the 6th brightest star in the night sky on the UK night of 2–3 September. 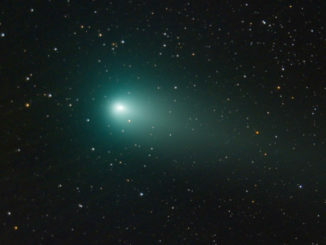 We show you how to find Comet 21P/Giacobini-Zinner around the time it passes within a degree of prominent star Capella.